Submitted by Peg Chapados, president of Maricopa Seniors, Inc.
Maricopa Seniors, Inc. recently celebrated the installation of the 100th lock box in Maricopa. 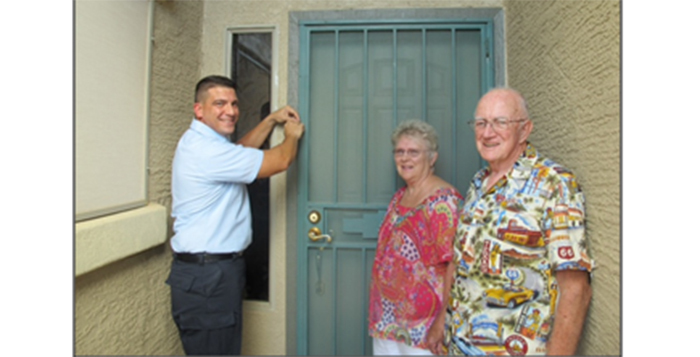 Thanks to a partnership between Maricopa Seniors, Inc., Maricopa Professional Firefighters Union – Local 4561 and Maricopa Fire Department, Maricopa residents have two options that offer peace of mind for about 60 cents a day: the 9-1-1 pendant and Home Key Box programs. Lynn Bernier is vice-president of Maricopa Seniors and coordinator of the Pendant Program. Lourdes Samples coordinates pendants and lock boxes in Province. Both ladies know and appreciate the value of seniors having one of both of these items. Imagine this: you’re an active senior who lives alone. You have some medical issues, but nothing that will keep you from staying in your home. You’re pro-active about precautions in the event of an emergency, so you have a pendant and a lock box. One day, you accidentally trip and fall. You’re conscious, but there’s some pain in your hip, so you don’t try to stand. You can’t reach the phone and there’s no one within shouting distance. What will you do? You push the blue button on your pendant and are connected to the 9-1-1 operator. You can talk to the operator through the pendant, and in a matter of seconds, Maricopa Fire and Maricopa Police have been dispatched; help is on the way. But you can’t get up to unlock the door. How will they get in? Your lock box contains keys to your front door. When Maricopa Fire arrives, they don’t have to break down the door. They quickly open the lock box and get the keys. It’s only been a few minutes, and help has arrived. Pendants work anywhere in the United States or Canada with a 9-1-1 system, so it’s portable for travel or out-of-town stays. It requires a land line, and can be adapted to work through a computer modem line. (The system will not work with cell phones.) There are no contracts, activation charges or monthly fees and the one-time cost is $149.95. Home Key Boxes come with mounting hardware and maintenance instructions. The box can hold several keys, info about pets in the house, medical conditions, medications, and other vital information. The boxes can only be opened by Maricopa Fire personnel. The one-time cost is $65. There are over 150 users in Maricopa who have a pendant or lock box, and they’ve been installed in homes in almost every community. These items have saved lives, provided an alternative to forced entry, and enabled peace of mind to those who have the item as well as family and caregivers. Order forms for the lock boxes can be found at Maricopa Fire Administrative Offices, Building D at the corner of SR347 and Honeycutt Road, at Maricopa ACE Hardware, at Maricopa Seniors, Inc. web site: www.maricopaseniors.org, or by calling Lynn with Maricopa Seniors at 602-377-2284. For more information about these programs or general information on Maricopa Seniors, email maricopaseniors@hotmail.com.